It's the little details that often get overlooked in advice for dungeon masters. I'm going to delve deep into some of the overlooked intricacies of the tools we dungeon masters like to use. This. series will be a look at what I tend to towards and maybe some comments on what others use. So step into my workshop as we delve into the tools of the trade. Paper has been a cornerstone of role playing games as much, if not more, than dice. 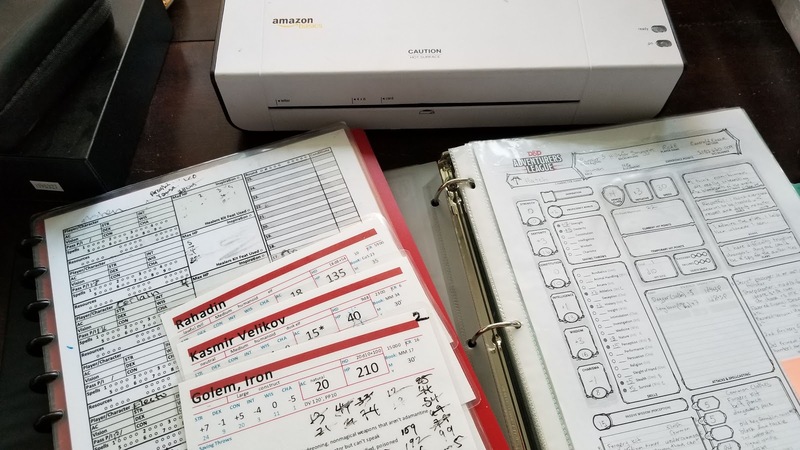 I tend to be a 'digital DM,' but I still use my fair share of paper. In fact I still use paper for thing I could probably do on my computer. Mapping is the big one for me, visual aids and laying out battle mats and accessories for them are also pretty high up there. I still take some notes on paper sometimes and track certain things that don't happen every session as well. For general one sided printing, I use 20 lb copy paper, but I think I'm moving to 24 lb paper for double sided or heavy inkjet printing. I like the feel of it and my fineliner pens don't bleed through as easily. 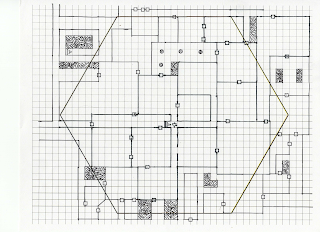 I haven't found a graph paper that I like, so i use Photoshop and make my own. I print my own hex paper as well so I can customize the sub hexes to the number I need. For printing something that's going to be around a while, maps, minis and props, I may use some 110 lb card stock instead. There is all kinds of specialized gaming paper as well, but I'll cover that when I do a battle maps article. One of the things that had saved me terms of paper use is a lamination. Anything I plan on using multiple times i laminate. Turn trackers, character sheets, encounter worksheets, I even laminate my pawns! I used several methods to laminate depending on the situation. For permanent I use 5 mil thermal laminating pouches. I like the way they feel, with a sturdy, plastic cover, as compared to the floppiness of the 3 mil pouches. They come in various sizes, from full page to 3x5. 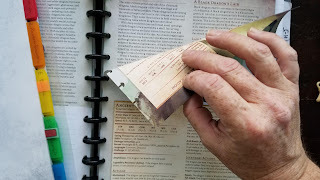 To temporarily laminate I use page protectors, this works best for character sheets, but if you use spell cards, monster cards or make your own they come in various sizes too. Lastly, when making something I need to cut in a cutting machine, I use self-sealing pouches. Speaking of cutting I use a couple of tools for different jobs. Sometimes plain old scissors or a hobby knife just won't cut it. My wife bought a Cricut that I use to cut out repeatable or intricate shapes. Mostly I use it for paper miniatures, but every now and then I cut out a paper prop with it. If I need a straight cut I have a paper cutter, it's basically a giant pair of scissors attached to a board for aligning the paper and cutting straight edges. I use it a lot for cutting the edges off of what I laminate. So where do I put all this paper? I use to use binders for everything, but I've since moved on to disc bound folders. Basically there are discs every inch that the specially cut paper fits onto. The punch is a tad expensive, but I started with a cheaper single page punch. The thing that really sold me was the ability to easily remove and reorder pages without unlocking anything like a binder. The first thing I mass punched was my 5e monster manual. The binding cracked and pages started to fall out (a common problem) so I weighed my options and between binder, page protectors, or spiral binding, I went with disc bound. When my curse of strahd's spine cracked I went straight to my disc punch. I love being able to pull out pages and have the book like open flat. Running a sandbox game isn't for the light hearted, organization is prime and being ready to respond to player actions is a close second. If you are properly prepared, a sandbox is an easy way to run a game. There are books, blogs, and podcasts by the dozens talking about different methods of pregame preparation. All have their own method; preparation is something that everyone does differently, just like dungeon mastering. So which one is for you? I can't say, but I can give you insight into the tools I use. Aside from good pens, a mechanical pencil, and a bunch of dice what do you need to prepare for a sandbox game? I'll tell you what I use and why. These two books by Kevin Crawford revolutionized my preparation style. They have advice on your GM binder and what to keep in it, an easy system for randomly determining and populating an area with cities, towns, ruins, and lairs and maps to steal. An Echo Resounding sets up domains and factions, details domain turns, and mass combat, should things get ugly. Both are short and easy to read and come with detailed examples to help you work through it the first time. I've adapted them to my style and use them for most of my randomly determined areas, and sometimes for pre-populated ones too. These two well worn and sticky-tabbed books are easily in the top three most used in my library. What's the top one? I prefer the first edition dungeon masters guide, but the fifth edition is no slouch! 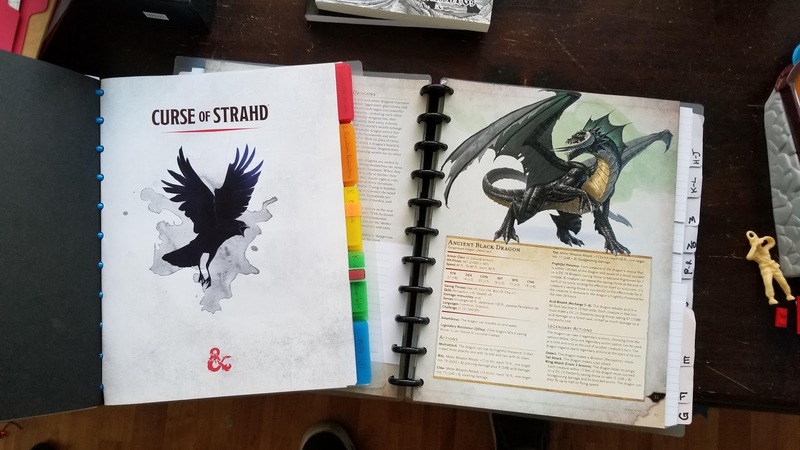 Both cover things beyond the rules of their respective edition, talking about time, non-player characters, and adventure locales just to name a few topics. 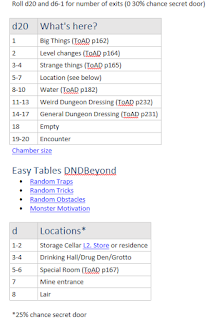 The random tables in each cover personalities, traits, motives, and best of all random dungeons. If I'm drawing out a dungeon for a game, making non-player characters, or creating an encounter, one of these is what I reach for. Seeing a theme yet? Random tables help you get away from same thinking. Anytime I need a question answered in my preparation I turn to a random table to break out of similar ideas. Similar ideas can be great in the beginning, even enforce a theme, but after a few sessions they start to seem stale. Random tables mix it up creating wild combinations that you need to make sense of; things I couldn't have come up with on my own. The books on my table lately have been The Dungeon Dozen, d30 sandbox and Tome of Adventure Design. The latter being my most used book in the last six sessions I prepared. Monsters are the base of encounters in Dungeons and Dragons. Whether you are making random tables or static encounters, you are going to need a lot more enemies than the ones in the back of the Players Handbook. Sometimes just flipping through a book will inspire an encounter or maybe even a whole adventure. That's the way the fifth edition Monster Manual is written, according to Mike Mearls. If you haven't read the Monster Manual, take the time, as it's well worth it. After exhausting that, pick up Tome of Beasts, Tome of Horrors, or use the fifth edition Dungeon Masters Guide and make some of your own! I like to run digital. Most of my collection is in PDFs, I make maps and graph paper, and keep all my notes online. At my game I run with my laptop, dndbeyond.com, and Nitro PDF reader. I even have a tv set up for maps, pictures of monsters, and rules to show the players. At home I like to prepare on my PC; there are four basic programs I use. A digital art program for maps, handouts, and paper minis. Photoshop is what I use, but GIMP, painter or whatever you have will work too. With online notes syncing across all devices, I can prepare wherever on whatever is handy (I do a lot of work on my phone). I use OneNote as my GM binder and have a lot of worksheets and forms set up to help me with the common things like settlements and adventures. OneNote works for me, but Evernote and Google Drive, or offline applications like Scrivener and Campaign Logger are also options. A PDF reader for all my PDFs, Nitro, Foxit, or Acrobat all work fine. The last one is a web browser. I get a lot of encounters, maps, paper minis, and ideas from the internet. Places like ENWorld, reddit, and Discord are some of my go-to communities. Remember great dungeon masters steal ideas! Just don't publish stolen material. Yes, as digital as I like to be, plain old paper is a staple for my game preparation. If only for scribbling notes or sketching an encounter, I always seem to find a need for paper. I have a disc bound notebook to jot stuff down quickly or take notes during an encounter. I use this notebook for when I'm stuck, somehow staring at a blank sheet of paper gets my creative juices flowing. A doodle here, a number there, a list of names, and I'm off to the races, heading toward OneNote with ideas in hand ready to develop into a solid encounter. 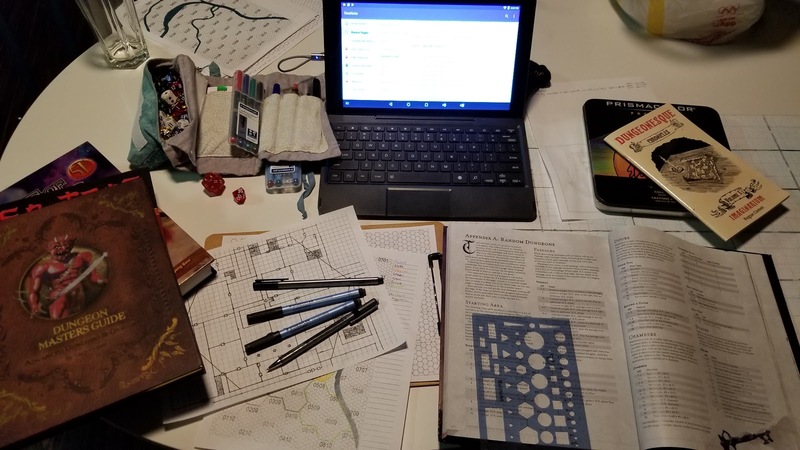 Preparing for a game is a path all dungeon masters have to trudge down, but it doesn't have to be such a chore. We're dungeon masters partially because we love to create and sometimes we need some help with that creation. Having the right tools can make that session preparation a whole lot more fun and easy. I hope I’ve introduced you to some that fit into your preparation style. 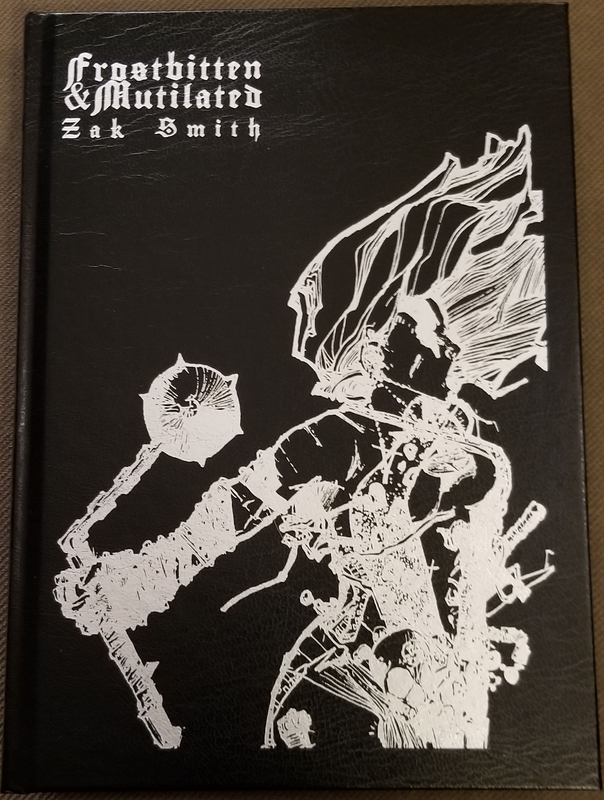 Zak Smith's latest release Frostbitten and Mutilated (March 2018) is about a cold, harsh land and the amazons that inhabit it. The players enter for whatever reason (probably making money in the untamed north) and begin a cycle of events that could end the world. By default the attempt fails, but more on that later, for now lets start at the beginning. I really OSR/DIY D&D book for their A5 (digest sized) books and the general quiality of binding and paper choice. The next thing I notice in almost any book is the art, Zak had previewed a lot of this on his blog but seeing it in print is another thing. I really like black and white art (because I'm color blind) and Zak brings so much depth to his pieces. By far, my favorite is a frost giant reaching down to grab the viewer. All of the pieces have the potential to enthrall me for hours and distract me from the text within. After initially flipping through looking at the art the next thing that catches the eye is the use of endpapers. 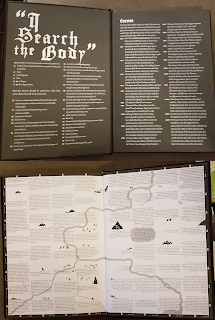 This is an OSR/DIY D&D thing that take what the author thinks you will use the most, in i search the body and the map, and puts them in an easy to reference place; inside the front and back covers. I usually tear apart the pdf and put it into OneNote, but if i were running one of Zak's books, I could run it with little else; probably only a bullet journal. The map is a simple grid, with rectangular sections to make the reading easier, is well laid out, and there is something in every section. The book starts out with a bit of advice from Zak about playing the environment. See, the rough landscape and inhospitable cold are not merely that, it are the ultimate foe of the party, the lands seeks to destroy those who interlope, crush the weak, and basically wreak all of humanity that it can. Those who can survive here are changed by the icy cold. Amazons born on the ice, witches with strange ways and new magic, and animals smarter than we. The animals are an interesting bit that make the land feel different from the usual dark fantasy. Opinionated goats, envious rats that seek to take all the humans build and wolves who don't stop until they get one of you. The animals here are truly unique to this land and have a voice of their own, if you can speak with animals. The arrival of the party (re)starts a Groundhog's Day like cycle of failure to summon the demon Belphagor the Beast, trapping them until they deal with the powers that are trying to summon it or they succeed and end the world. Its a unique spin on an adventure that I have tossed around in my head a few times. The staging is sound and the reasons make sense, if I do run this, I will make sure the party goes through at least one cycle and restarts. There are two dungeons in the book, one plot related and the other one I'd like to drop into my current world. They both breathe the atmosphere of the setting and expand upon it to the players. Giving the players some knowledge of the setting is one of the harder jobs of the Dungeon Master and having a bit of help is a good thing. After 100 pages of mostly setting and exposition come the crunch, the first of which is two new classes. The Amazon and the Witch. Both of these take a base OSR class (fighter and mage, respectively) and add a random roll to level ups instead of traditional gains from attaining new levels; like the Alice class in A Red and Pleasant Land. These are some great thing like a plus to an ability, weapon making, damage resistance, souring milk with a glance, bathing or eating requirements, modifications to spells and so many more differentiating abilities to make each character unique. These thing are going to make their way into my current campaign as boons and curses. This section of the book rounds out with substances, survival and some really good (like I'm going to use it RIGHT NOW) advice for running a wilderness sandbox. The last bit is random tables. Adventure elements for making innocuous connections into adventures, random locations for adding to the map, Amazon divination results and tables to make new amazon tribes, twenty drastic measures to rid yourself of a curse, non-player confrontations for figuring out why these two groups are hanging out, mutations, two treasure tables; the regular 'I search the body," and "If you look closely," descriptive combat injuries for spicing up combat, random encounters and rival NPC parties for quick determination of who the party stumbled upon. Again most of these are going right into my current campaign in some form or other. 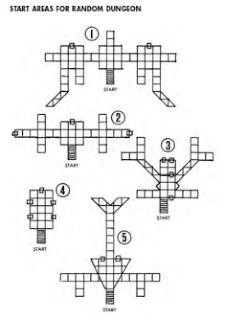 I really dig random tables and the quality of these goes beyond the regular to the outlandish and sometimes gonzo that I've come to expect from OSR/DIY D&D. Overall another success for Zak Smith, I can hardly say a bad word about it, but if I did I would say that Zak's writing is a bit above my grade level and I need a dictionary to read it. Also this is a hard thing to just drop into a regular 'vanilla' fantasy game. If you've already established a base line for regular orcs and goblins, then you may have a difficult time getting buy in from the players. Even though I will probably not play this through as a campaign, I will definitely cherry pick some a lot of the ideas and themes from it. I've been working on an abstract means of exploration for dungeon, city, and other small areas I don't feel like mapping as we go at the table. The need comes from wanting to prep less and have more surprises at the table. 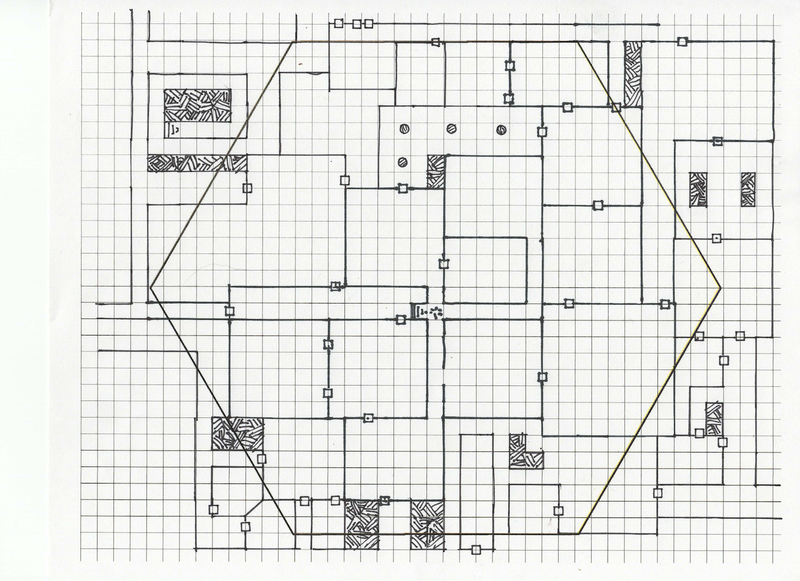 I've always liked random dungeon generation, in fact I rarely make dungeons by hand without my 1st edition DMG. I decided on hexs, as I am going for the wilderness hex crawl feel, but I could have just as easily gone with squares. Using hex size based on my maps (City of Zobeck) and preference of sub hexes (six per hex) I came up with hexes approximately 144 feet from flat to flat. Exploring a dungeon at my table takes ten minutes for two hundred feet, or a dungeon turn. I abstract that further to say a turn is between 3-10 minutes and keep track of it with six dice I drop into a cup at the table and roll for encounters when it is full or when they make a lot of noise. 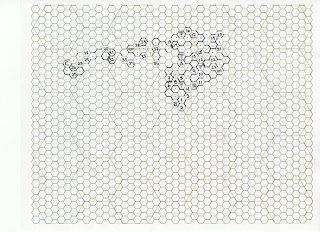 This abstracts nice to my 144 foot hex assuming it is not a straight corridor, which I am. I broke out my 5e DMG (gasp!) and rolled up a dungeon on a hex that size for a visual sample of what the players are navigating. 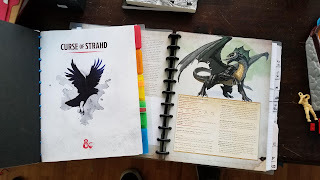 I've been using the Tome of Adventure Design for my last six sessions. It has extensive tables, that I am using, for random dungeon creation. Basically my plan was to strip out the corridors and use it as is. Of course, as is is never enough for me, so I started customizing table. The table gives a 50% chance for an empty hex (good average for an average adventure) and a 10% chance for an encounter. Normally I'd roll every so often for encounters, but this has it baked in so every turn (10 minutes, remember?) there is a 1 in 10 chance for an encounter, that's equal to the average hostile wilderness or dungeon area in many supplemental RPGs. In addition to rolling on the table I am using a d6-1 to account for exits from the hex a roll of 0 has a 30% chance (1-2 on a six sider) for a secret door. After my initial plan, I got to generating a sample map; not only to see how my distribution looked in practice but to show my players should they choose to map. I started off with a d10 table, but I didn't like how often some things (like level changes and large monuments) were coming up. I changed to a d12, but eventually settled on a d20. Exit locations are just placed how I like on my sample, but I plan on rolling a d6 for direction at the table. At this time I am not sure how I like it, but am going to generate a sample with a d4-1 for number of exits to see how that looks. I also like the idea of rolling 3 dice every time, what's here (d20), number od exits (d4-1), and exit location or secret door chance (d6). Although typing that out I'd need to roll up to two times more for extra exits. 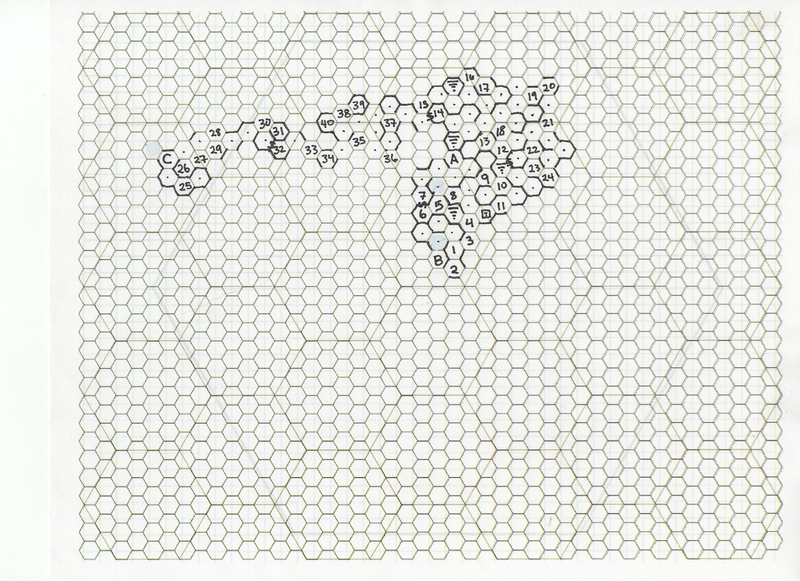 Numbers are locations (roll of 1-10) and dots are explored areas. So far its looking pretty good, but I have some more testing to do today and we need to see how it stands up at the table! Update: I'm liking the d4-1 for exits, but stairs are coming up scarce!